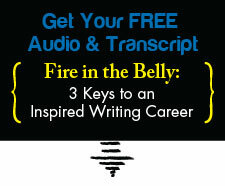 A Precious Elixir for Busy or Struggling Writers | Writing & Book Coach | Marla Beck, M.F.A. Imagine with me, for a moment. Imagine, if you will, that I’ve just handed you a small bottle with a rare and magic potion inside. Just one drop or two of this precious elixir is guaranteed to spark more writing focus, passion, energy and inner fire than you’ve experienced in years. What will you do with my gift? Will you do your due diligence, performing a thorough risk/benefit analysis on the bottle’s contents so you can make an informed decision to try the elixir (or set it aside as not-right for you)? Will you permit yourself to uncap the bottle and then take just a little whiff? Or…will you look me in straight in the eye, and take a moment to consult your heart? And when your heart gives you the greenest of green lights, will you uncap the bottle straight away, sample the elixir and immediately step onto the path of a profoundly transformed, infinitely more enjoyable writing life and habit? The writing life and habit you dream of dwell just on the other side of your struggles — all those time pressures, blocks, avoidance tactics and vague, exhausting strivings you suffer from every single day. Imagine, for a moment, that you take my magic elixir, and it works. Will you write with more creativity, power and focus than you’ve been able to feel in decades? Will you finally master the art of putting YOU back into your busy life and schedule? Will you feel more whole? More confident? Will you get back on track to realizing the writing potential you know, deep down inside, that you’re absolutely capable of? If my math is correct, this new year of ours is officially 33% complete as of today. This means you’ve still got a solid shot at making 2018 your best writing year yet. You’ve got a terrific chance to reclaim your time and focus and finally, completely rewrite your personal story of writing struggle, striving and overwhelm. To get these radically different writing results though, you must take a very different approach to writing than you’ve ever tried before. You’ve got to solve your writing problems at their core. To take the shortest path to writing bliss, you need an experienced guide: someone to save you time, show you a clear path to exactly the writing achievements you want, and teach you the mysterious art of “how to write consistently” no matter how overwhelmed, stretched, busy, pressured or unfocused you feel right now. I am here to help. I won’t hand you a little bottle of magic potion, but I will help you to quickly, confidently rewrite your writing story, so YOU master your writing challenges and YOU become the hero, champion and true voice we both know you already are. Ready to create fresh writing magic? Contact me here and let’s get started.